In the centre of this 1978 magazine cover is the unmistakable figure of John Tavener. But who is the lady towering above him? And there is another mystery lady here. Oh St Theresa, at the very least. TWD, pretty close. 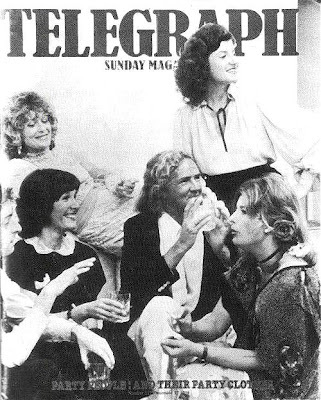 John Tavener's opera Thérèse was given its first performance at Covent Garden in October 1979, just ten months after that magazine cover appeared. But I'm afraid it is not St. Theresa. She was busy with rehearsals when the photo was taken. The woman in question looks like Arianna Stassinopoulos, who DID live in London at the time. Well done ddavewes and Drew80. Yes, the mystery lady was Arianna Stassinopoulos, now Arianna Huffington. She was an item with Bernard Levin for quite a while, and John Tavener dated her sister Agape.